Tool to decrypt/encrypt according to Mary, Queen of Scots. Mary Stuart code is a substitution cryptogram by symbols extended to the words used by the Queen of Scots. Team dCode likes feedback and relevant comments; to get an answer give an email (not published). It is thanks to you that dCode has the best Mary Stuart Code tool. Thank you. > [News]: Discover the next version of dCode Mary Stuart Code! How to encrypt using Mary Stuart cipher? The alphabet contains 5 blank characters that can be used as space or word separator (this makes the frequency analysis more complex). How to decrypt Mary Stuart cipher? 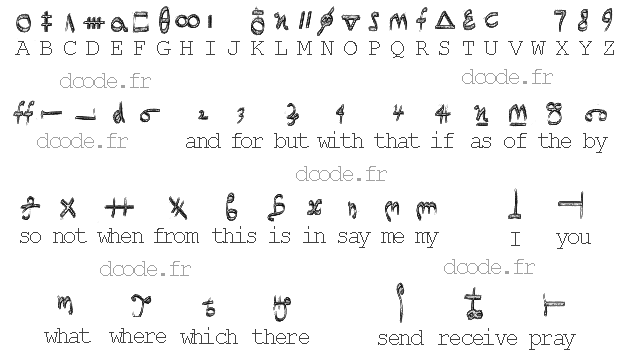 Decryption is a simple correspondence between Mary Stuart symbols and letters (or words) in plain text according to the alphabet described above.. Example: is translated to QUEEN. Mary Stuart (or Mary I of Scotland) was born December 8, 1542 (and died February 8, 1587) was the Queen of Scotland from 1542 to 1567 and Queen consort of France between 1559 and 1560. Improve the Mary Stuart Code page!